It is hard to believe that onion juice could prove to be useful in getting rid of acne. Moreover, it helps prevent and heal acne scars. Onions have long been used for treating a number of ailments like upset stomach, cough, headache, rheumatoid arthritis, and so on. Onions have remarkable medicinal properties because they contain sulfur compounds that help treat skin diseases. The antimicrobial and anti-inflammatory qualities of this herb fight against infections, and reduce redness and inflammation. In addition, onion extract has been shown to have a healing effect on scar tissues because it controls the production of collagen. This is helpful in treating keloid scars. On the other hand, the extract tends to stimulate collagen production when dealing with depressed scars in order to heal them. A study on the effect of onion extract gel versus petrolatum emollient on surgical scars found that although petroleum jelly more effective in treating the scars, yet using onion extract is better than using nothing at all. The surgical wounds that were treated in this study were at least 4 cm in length. Acne scars, however, are not that big. To clear your acne using onion, you need to apply onion juice on your face. You can blend an onion in a blender or simply grate it and then extract the juice. It is excellent for greasy and combination skin. For best results, prefer to use freshly extracted onion juice on your skin. If there is unused juice remaining after the application, you can store it in the refrigerator up to two to three days. Make sure you wash your face with clean water before applying any of these face masks. Simply leaving onion juice on your acne and scars for about 15 minutes is also beneficial in getting of these problems. Peel a medium sized onion and run it in a blender or food processor. Cook some oatmeal in water for about 20 minutes. When the oatmeal has somewhat cooled, add the onion paste in it, along with a little honey. Spread this mask on your face and leave on for about 10 minutes. Rinse it off with lukewarm water. • Prepare a face mask by mixing one tablespoon of onion juice and one teaspoon of honey in a tablespoon of kaolin clay. Apply this thick paste on the affected areas and wash it off after about 20 minutes, when it dries completely. It shall help cure acne and blemishes, and reduce excess greasiness on your skin. The kaolin clay shall also exfoliate your skin. • Cut a big white onion into four pieces. Put one of these pieces in the blender, along a bunch of parsley, some distilled water and honey. Turn on the blender to puree all the ingredients. Store the resultant mixture in the refrigerator for a few hours to get rid of the onion smell. Finally, mix in some kaolin clay in this mixture to get a pasty consistency. Apply it on your acne and acne scars. Rinse it off after 20 minutes to reduce the redness and inflammation around your pimples. Whisk an egg yolk and mix one tablespoon of olive oil and two tablespoons each of onion juice and cucumber juice in it. Rub it on your skin and leave on for 15 minutes before washing it off with lukewarm water. You can read more about the beauty benefits of cucumber, here. Take the pulp of almost six to eight boiled plums and mash it with a folk. Mix one tablespoon of onion juice and one teaspoon of olive oil in this fruit pulp. Apply it on your face, especially the affected areas and wash off after 30 minutes. Repeat this procedure daily for four weeks to cure acne and maintain younger-looking skin. Put the pulp of a pear, a quarter glass of cold milk, two tablespoons of onion juice in a blender or food processor. Smear it on your face. Rinse it off after 20 minutes to clear acne and get a soft, glowing skin. Beat an egg yolk, and add one tablespoon each of onion juice, carrot juice, and olive oil in it. Massage this mixture onto your skin and let it sit for about 20 minutes before washing it off. Apply it at least once a week to get rid of acne and enhance skin elasticity to avoid premature aging. Mix half a cup of diced onions in a cup of olive oil. Set it aside for about two weeks. Strain the oil. Apply it on the affected areas for 15-20 minutes on a regular basis to treat acne and fade acne scars. Apart from treating acne, onion juice can be applied on your skin to fade age spots, reduce blemishes, and improve your skin tone. In addition, when mixed with honey and applied on bald patches on the scalp, it can help reverse hair loss. Good job. This is very informative article for those who believe in natural remedies. Admin you have great effort. 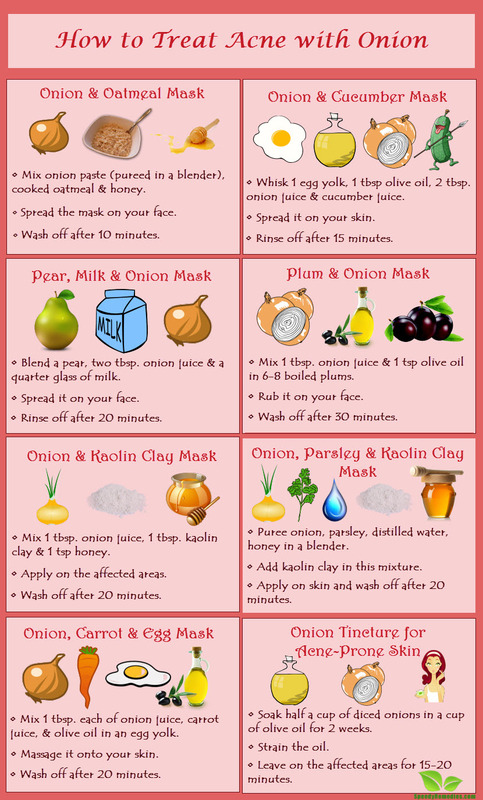 Tips that you have been provided to treat acne with onion are too much interesting and very useful. Thnks 4 the info. My son will b very pleased if it wrks. thanks in bunch,i hope i will work? thanks in bunch,i hope it will work? thanks i believe in onion. Onion juice is my new bestfriend it really works for both hair and skin.